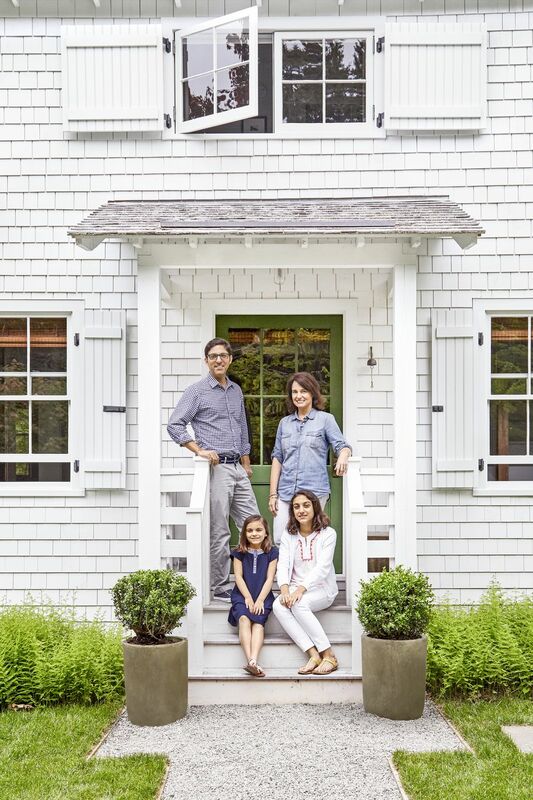 Alison and Michael Brewer are co-owners of Gray Wade Design & Development, a design-build firm in Charleston, South Carolina, so they certainly have an eye for detail. Which is why the moment they laid eyes on this quaint cottage, their creativity was sparked and they knew it had to be theirs. 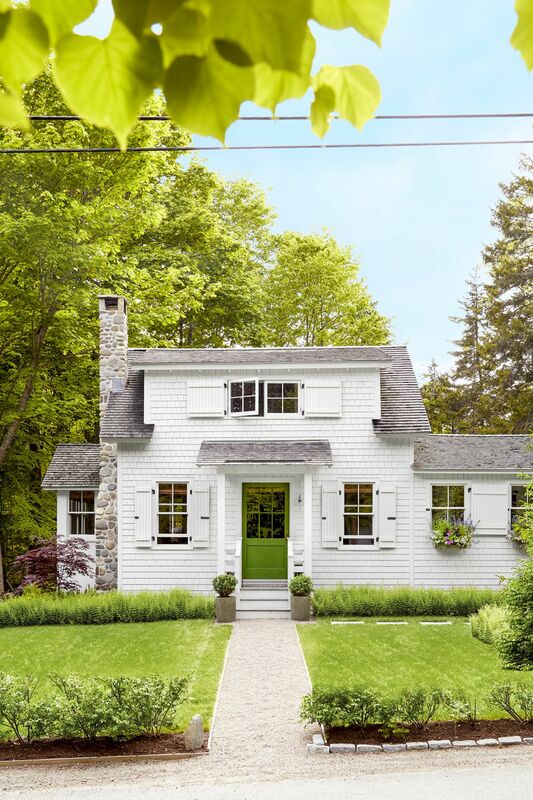 After years of vacationing in Southwest Harbor, Maine, the Brewers bought this adorable 1,200-square-foot fixer-upper. Renovating this little gem wasn’t easy. The town is located on a 100-square-mile island only accessible by bridge, making trips to furniture and hardware stores a bit of a struggle. “We really had to think about measurement because returning things is such an ordeal,” Alison told Country Living. The welcoming living room is simple, yet elegant. The Brewers went for a mix of rattan and other upholstered items of furniture, including a tufted, Chesterfield-style sofa. “We wanted it to look like we could have inherited a lot of what was in the room—even the newer things,” Michael said. Instead of an all-white kitchen, like in many tiny homes, the Brewers opted for a beautiful mix of materials. 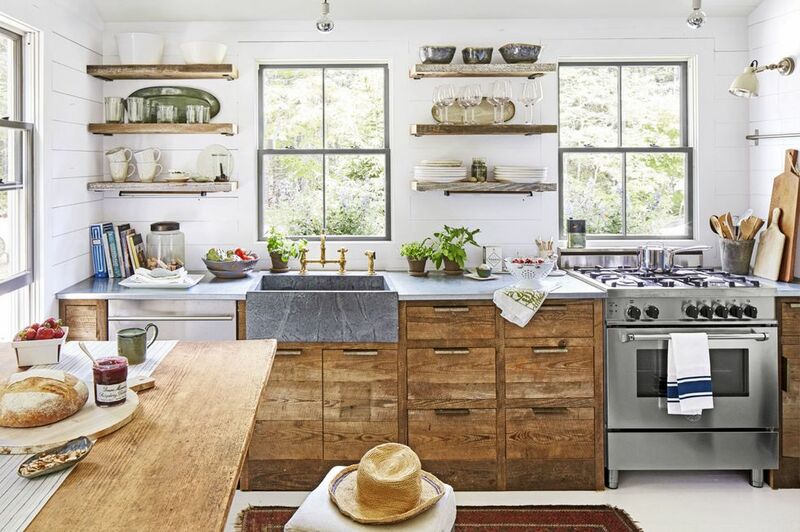 Reclaimed South Carolina barn wood was used for the cabinets and shelves, galvanized metal for the countertops, soapstone for the sink, and unlacquered brass for the hardware. All the materials were specifically chosen for a reason. “Nothing is too precious. Everything about the kitchen—and the house, really—is designed to take wear-and-tear. The more wear, the better it will look,” Michael said. Working with a narrow kitchen, the couple added extra counter and prep space with an antique drafting table that doubles as a breakfast table. When the table isn’t being used as a workspace, the Brewers, and their two children, like to hang out here. 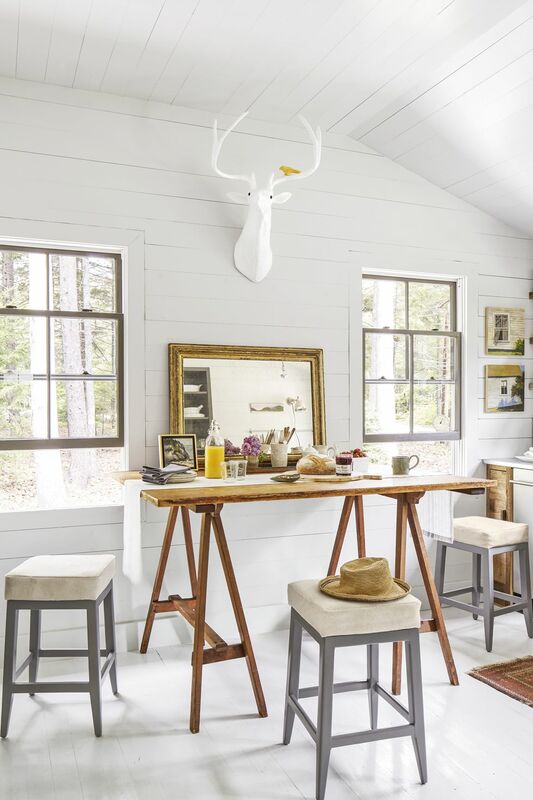 Custom-made cowhide-covered stools and a paper mâché deer decorate this charming nook of the house. Once a closet, the Brewers transformed this room into their formal dining room. A wooden table with Lucite Danish-style chairs sits in this charcoal-hued room. 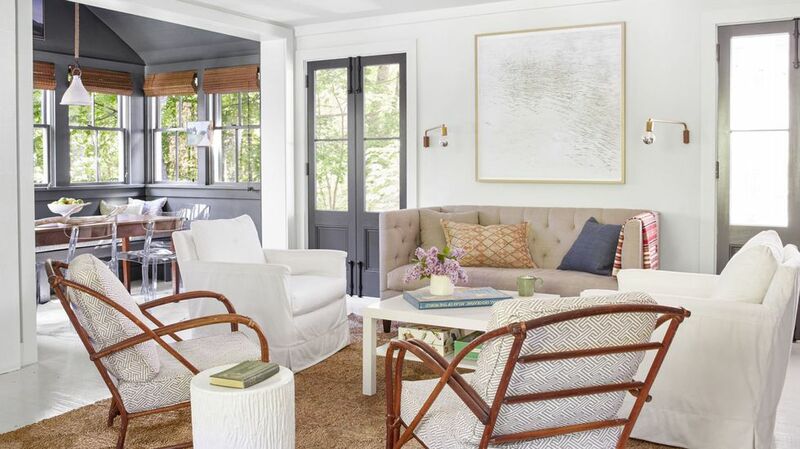 Large windows let in an abundance of natural light, and the decor was kept to a minimum. A granite fireplace sits in the corner of the living room near the workspace. There isn’t central heat in the home, so the fireplace provides much of the heat in the house. 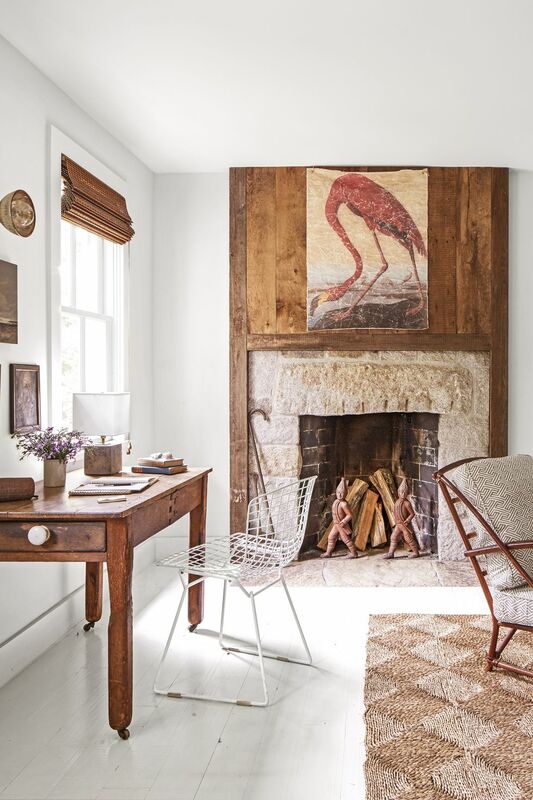 A white Bertoia chair is the perfect piece of furniture for the space, as its very unobtrusive. An old storage unit was attached to the house and converted into the master bedroom. 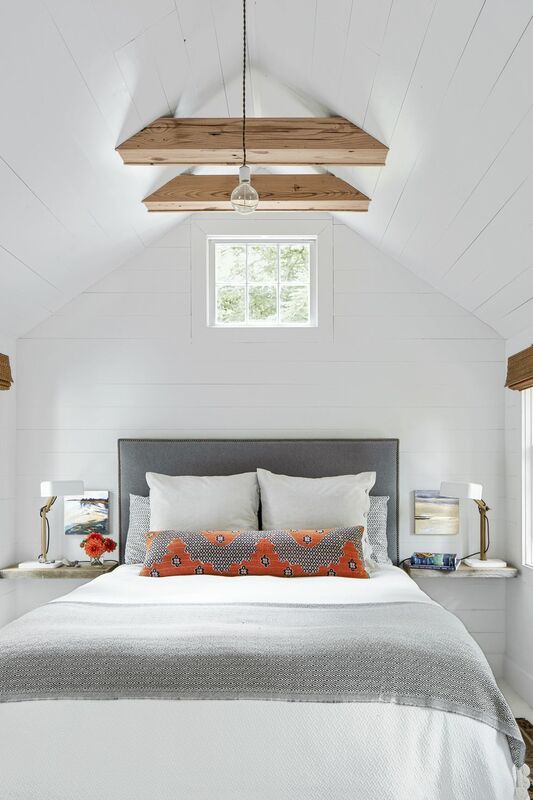 The sleek and cozy bedroom has a queen-size bed, surrounded by white wood-planked walls and stunning wood ceiling beams. There are also two floating tables on either side of the bed serving as nightstands. Built-in bunk beds are the main feature in their daughters’ shared bedroom. 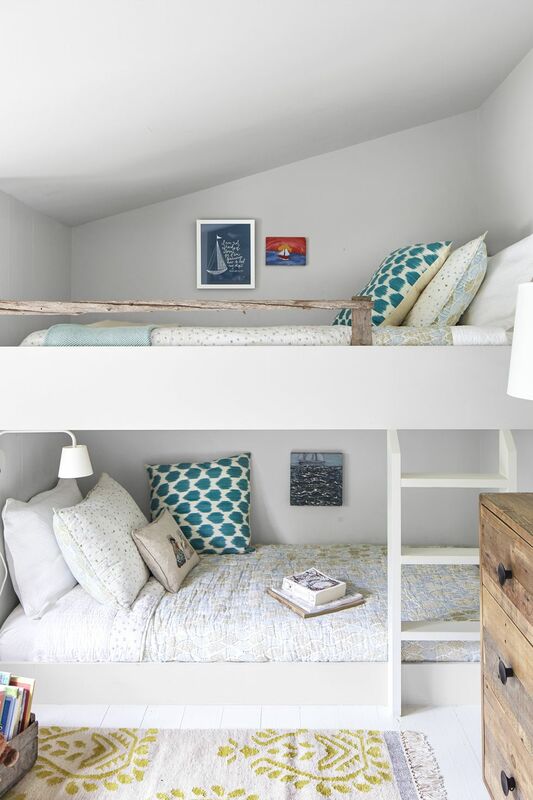 The charming bunk beds are simple and understated, and the rustic theme continues into this room. Reclaimed driftwood was used for the railing and the dresser was made from old reclaimed barn wood. The girls also like to take charge of their decorating. “At flea markets, we like to give them $10 and see who comes back with the best treasure,” Alison said. The guest bedroom is just 10-feet wide. 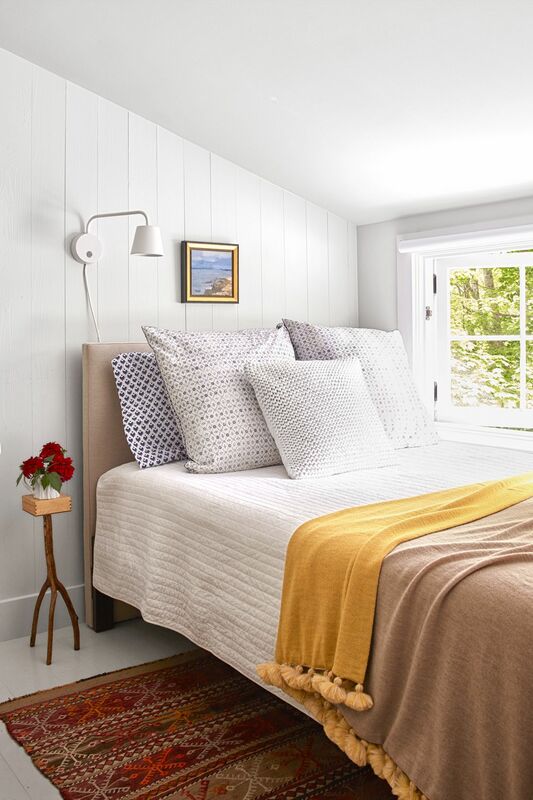 The room is just big enough for a full-size bed, small table, and a few elements of decor. The tiny table was a gift from Michael’s aunt. “It’s from Manset Little Farm, a nearby store known for its whoopie pies, but they also showcase local artisans,” he said. 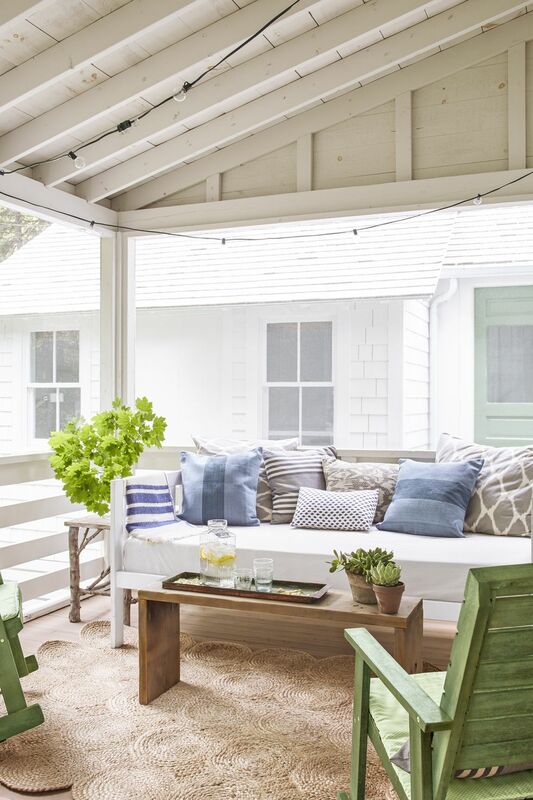 The screened porch adds an extra 250-square-feet of living space to the little cottage. “We just open the French doors, and it feels like we’ve got another room,” Michael boasts. A white-washed daybed is perfect for relaxing, and a slim wooden bench is a gorgeous (and space-saving) alternative for a coffee table. 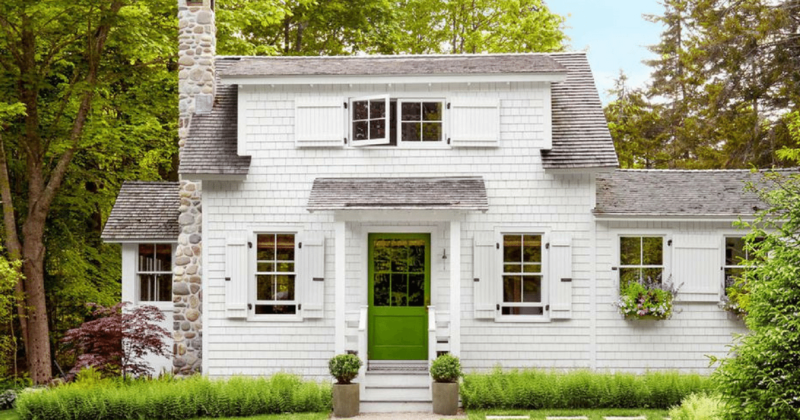 When your vacation home is this adorable, it would be hard to leave!